January 17, 2012 - Oliver VTOL announced a commercial concept of its "Hexplane," an innovative six-engine vertical take-off and landing (VTOL) aircraft that holds the promise to fly faster, further and safer than any VTOL in the industry. The commercial Hexplane concept, based on a Boeing 737-100 fuselage, has three wings and propulsion units from Bell/Boeing?s V-22 Osprey. The commercial Hexplane could fly above 30,000 feet at cruise speeds greater than 425 miles per hour with ranges exceeding 1,500 miles. A Boeing 737-100 has a ceiling of 35,000 feet at cruise speeds of 485 miles per hour with a maximum range of 1,770 miles. Like other versions of the Hexplane, the commercial version Hexplane will also be able to continue to perform full gross weight vertical operations if a propeller, engine or a gearbox fails - the first VTOL with these capabilities. "The commercial version of the Hexplane is a powerful proof of concept that we have overcome the historic challenges for VTOLs, achieving the speed, range and payload to similarly powered fixed wing aircraft,? said Richard Oliver, founder and chief executive officer (CEO) of Oliver VTOL and the designer of the aircraft. ?However, the Hexplane goes further by providing the ability to perform a safe maximum gross weight vertical landing at its hover out of ground effect (HOGE) limit altitude with a failed propeller, gearbox or engine." The commercial Hexplane also holds great potential to help relieve congestion at major airport hubs which is creating increased pressure on airspace and runway capacities, according to several aviation industry experts. ?As the country?s scheduled air carrier industry continues on a decade-long contraction in markets serviced, coupled with a transition to larger fixed-wing aircraft, flying on longer legs, numerous third- and even many second-tier markets are being vacated,? said Dr. Bruce J. Holmes, CEO of NextGen AeroSciences, LLC. ?This trend is neither good for the communities affected nor the nation's economic performance. ?Meanwhile, the demand for air access to communities continues to grow, creating increasing pressures on a decreasing number of airports, and leading to growing delays and reducing the speed by which we can conduct our commerce and enjoy our leisure. Concepts such as Hexplane hold potential for relief from this long-term downward trend in the nation's aviation connectivity, and represent a ?disruptive technology? of the sort that leads to new services of value to the flying public.?. The U.S. Patent office published Richard Oliver?s patent application for the Hexplane on July 14, 2011. The company expects to receive a patent for the aircraft in the next 12 to 18 months. The Hexplane's capabilities have been validated in a report issued by DAR Corporation, Lawrence, Kan. The scientific advisors for the report were: Dr. Willem Anemaat, president of DAR Corporation; University Of Kansas Professor Emeritus Dr. Jan Roskam, founder of DAR; and Penn State Boeing Professor Emeritus, Dr. Barnes W. McCormick. In October 2011, Oliver VTOL LLC announced a ?Hexplane Heavy Lift (HHL)? concept that has the potential to meet the military?s need for a new, large vertical take-off and landing (VTOL) transport aircraft. The Oliver VTOL HHL concept could be a strong contender to meet the requirements of the military?s Joint Vertical Aircraft Task Force (JVATF). The Joint Future Theater Lift (JFTL), Army Heavy Lift (AHL) and the Heavy Lift Replacement (HLR) requirements have continually changed since the Quad Tilt Rotor (QTR) was proposed in 1999, mainly due to the growth in the military?s planned Future Combat System (FCS) payloads. 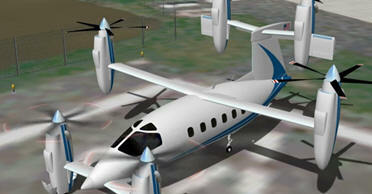 Oliver VTOL?s Hexplane HHL concept was filed in a U. S. Patent office application on September 12, 2011. The aircraft has three wings and six rotating propulsion units with a payload capability similar to the cargo capacity of a Lockheed C-130J-30. Based on early analyses and flight simulations, the Hexplane HHL would fly above 25,000 feet at cruise speeds greater than 425 mph with ranges exceeding 1,500 miles. The Hexplane HHL landing requirements are significantly smaller than current QTR concepts, a key factor in the ability of a heavy lift VTOL to operate from naval ships and confined landing zones. The Hexplane is designed using well understood applied aerodynamic engineering principals and therefore does not require expensive advanced development activities which usually plague novel VTOL solutions. Advanced development costs must be amortized over the typically small quantity of aircraft produced adding significantly to their cost. A planned Hexplane technology demonstrator is expected to have a ceiling greater than 35,000 feet and carry a load of 1,000 pounds, 1,000 statute miles at 400 miles per hour. This is a capability that the Defense Advanced Research Projects Agency (DARPA) has challenged the aviation industry to accomplish. Oliver VTOL officials believe the Hexplane technology could be used in both manned and unmanned flight operations for the military. The aircraft also could be used as an air ambulance because its speed and range would allow the transport of patients faster and further to access more trauma centers than currently possible. Other applications include offshore oil platform support, search and rescue, and business aviation. Oliver VTOL, a start-up aircraft development company based in Atlanta, is currently in the process of raising its first round of equity investments that will be used to develop a technology demonstrator of the Hexplane as well as provide funds for marketing and operating costs.